Sleep apnea is a disorder in which people have one or more pauses in breathing while they sleep. Sleep apnea usually is a chronic ongoing condition that disrupts your sleep. You often move out of deep sleep and into light sleep when your breathing pauses or becomes shallow. 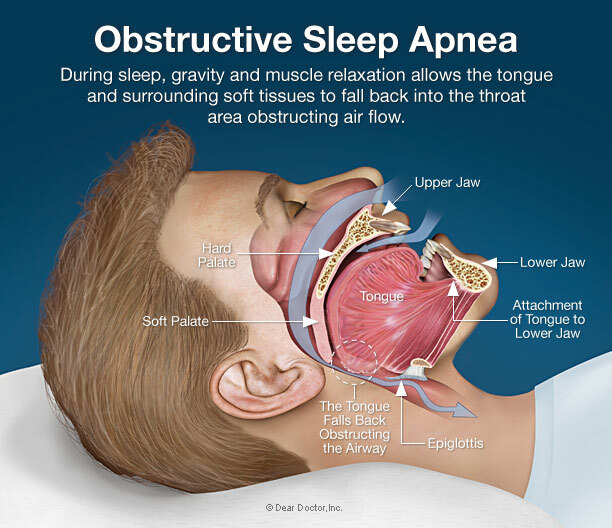 The most common type of sleep apnea is obstructive sleep apnea. This most often means that the airway has collapsed or is blocked during sleep. The blockage may cause shallow breathing or breathing pauses. When you try to breathe, any air that squeezes past the blockage can cause loud snoring. Obstructive sleep apnea is more common in people who are overweight, but it can affect anyone. Central sleep apnea (CSA) is caused by irregularities in the brain’s normal signals to breathe. Most people with sleep apnea will have a combination of both types. Sleep apnea is a chronic condition that requires long-term management. Lifestyle changes, mouthpieces, surgery, and/or breathing devices can successfully treat sleep apnea in many people. Untreated, sleep apnea can be life threatening. Excessive daytime sleepiness can cause people to fall asleep at inappropriate times, such as while driving. Sleep apnea also appears to put individuals at risk for stroke and transient ischemic attacks (TIAs, also known as “mini-strokes”), and is associated with coronary heart disease, heart failure, irregular heartbeat, heart attack, and high blood pressure. Although there is no cure for sleep apnea, recent studies show that successful treatment can reduce the risk of heart and blood pressure problems. There are a variety of treatments for sleep apnea, depending on an individual’s medical history and the severity of the disorder. 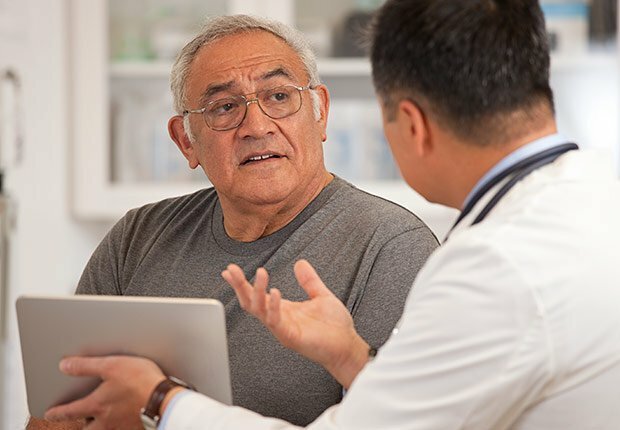 Most treatment regimens begin with lifestyle changes, such as avoiding alcohol and medications that relax the central nervous system (for example, sedatives and muscle relaxants), losing weight, and quitting smoking. Some people are helped by special pillows or devices that keep them from sleeping on their backs, or oral appliances to keep the airway open during sleep. If these conservative methods are inadequate, doctors often recommend continuous positive airway pressure (CPAP) machine, in which a face mask is attached to a tube and a machine that blows pressurized air into the mask and through the airway to keep it open. Also available are machines that offer variable positive airway pressure (VPAP) and automatic positive airway pressure (APAP). A BiPAP machine has settings for both inhaling and exhaling to make it easier for people who have higher pressure settings to exhale. This unit also has a built-in humidifier. There are also surgical procedures that can be used to remove tissue and widen the airway. Some individuals may need a combination of therapies to successfully treat their sleep apnea. If your loved one has been diagnosed with sleep apnea, and your doctor has prescribed use of a continuous positive airway pressure, or CPAP, machine, it can be difficult to decide which one will best suit your needs. A CPAP is not always covered by insurance, and the elder will need it for a long time, so think of the purchase as an investment. Because pressurized air requires a closed seal for it to be effective, CPAP machine users are required to wear specialized masks when sleeping. However, an uncomfortable mask or chin strip is usually what causes people to stop wearning their CPAP. It is absolutely vital that the CPAP chin strap and mask fit properly. Leaks from a mask that is the wrong size, causing the pressurized air to escape, reducing the effectiveness of your nasal CPAP machine. Look for straps that come in different sizes, to accommodate the user’s head, as well as soft, stretchable straps. Straps extend around your face and over your head to hold the nasal cushion in place while the breathing tube extends up over your head to allow sleep in any position. Unfortunately, many users find the straps on their face to be uncomfortable, especially when initially trying to fall asleep. It is difficult to get used to wearing a CPAP mask every night, but there are a variety of CPAP accessory options that can make the machines easier to adjust to. For example, users can choose between a mask that covers the entire face, or one with tubes that seal inside the nostrils. There are CPAP masks that work best for people who lie on their stomachs and others for people who toss and turn. Experiment with CPAP mask accessories to find the one that is most comfortable for your elderly parent. If you find yourself frequently traveling for business or pleasure, be sure to choose a model that is portable, compact, and easy to take with you. Some machines are available with an optional DC power supply for you car’s cigarette lighter, or can be run with an optional integrated battery, making it the ideal choice for traveling by airplane. Clinical research has shown that CPAP patients tend to be more compliant with the addition of heated humidity to their CPAP program. A CPAP humidifier can prevent a dry mouth and the sinus problems caused by the stream of pressurized air. A CPAP humidifier works by using a fine mist of warm or room-temperature distilled water to keep your nasal passages moist. When choosing a CPAP machine with the heated humidifier, keep in mind how much space the machine will take up with the humidifier attached. The ramp is used to temporarily lower the air pressure initially to allow the CPAP machine user to fall asleep more easily. The pressure then gradually increases to the prescribed level. Adjustable ramp settings allow the user to set the amount of time it takes for the CPAP machine to reach the prescribed level. Some CPAP machines, include a feature the decreases the air flow pressure when you exhale. Exhalation pressure relief is usually not a necessary feature, and most CPAP machines that include it are much more expensive. All newer CPAP machines are very quiet, but some are more quiet than others. Although the majority of noise you hear while using CPAP therapy is the sound of air rushing through the tube, the quietness of the motor is an important factor to consider. Some CPAP users find it more pleasant to breath with APAP than with CPAP because the pressure automatically changes as needed to deliver the minimal pressure needed. With a CPAP, on the other hand, the pressure is set at the highest necessary to keep the airway open, even though the high pressure is needed only a fraction of the time. The bottom line: Before purchasing a CPAP machine, be sure to look at all of the options and features available. If someone you care for is suffering from sleep apnea, don’t ignore it; it’s not likely to go away on it’s own, and it could lead to serious complications. See your doctor to discuss treatment options, including the use and care of a CPAP machine. I hope this article provided you some helpful ideas.